Many modern TVs now include an extra frames feature, usually either 120Hz or 240Hz. This just means they take the source video, which is usually between 24-30FPS, and add new, interpolated frames between the original frames that make the motion look much more smooth. High framerate (HFR at 48fps) was used in The Hobbit and will be used in upcoming films like the Avatar sequels, so why not watch all your movies at higher framerates? A lot of people don’t realize this, but 99% of TVs made before this feature was introduced are actually capable of displaying 50FPS and 60FPS, and of course most LCD monitors display 60FPS as well. This tutorial will allow you to convert videos of any framerate to higher framerates; 25FPS becomes 50FPS and 24/30FPS becomes 60FPS by default, or you can specify whichever framerate you want. This script offers greater quality than any televisions I have seen. Note: This can now be done in realtime using Universal Media Server! This post provides instructions on how to easily convert any video to 60FPS, which allows you to take advantage of this feature of modern TVs on your computer monitor or TV without actually buying anything. The files needed for this step are found in this zip folder (~3MB). Run and install the file AviSynth.exe. It is an early version of AviSynth 2.6 that is more stable and faster for multithreading than 2.5 releases. 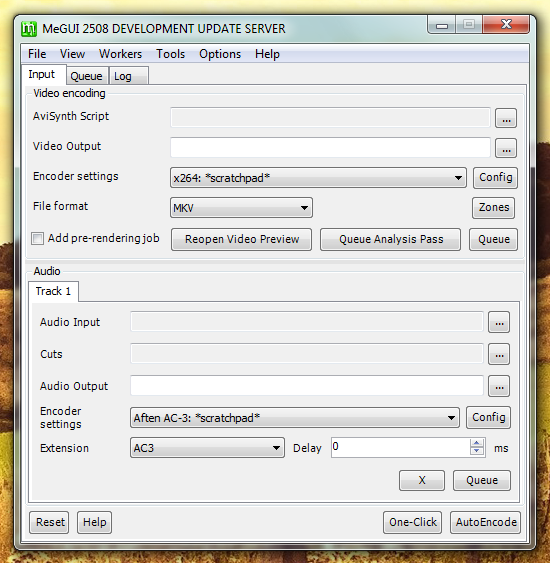 Download and install MeGUI, run it, let it update all the things it wants to and import all of the presets. Close MeGUI and extract the files in the tools folder from our zip file into your MeGUI tools folder, which for most people will be either C:\Program Files (x86)\MeGUI\tools\ or C:\Program Files\MeGUI\tools\. When that is installed, run MKVMerge (Start Menu -> All Programs -> MKVToolnix -> mkvmerge GUI). You will also need codecs installed. If you don’t already have them I recommend K-Lite Mega Codec Pack. If you install K-Lite, make sure to select “Profile 9: Lots of Stuff” during installation. 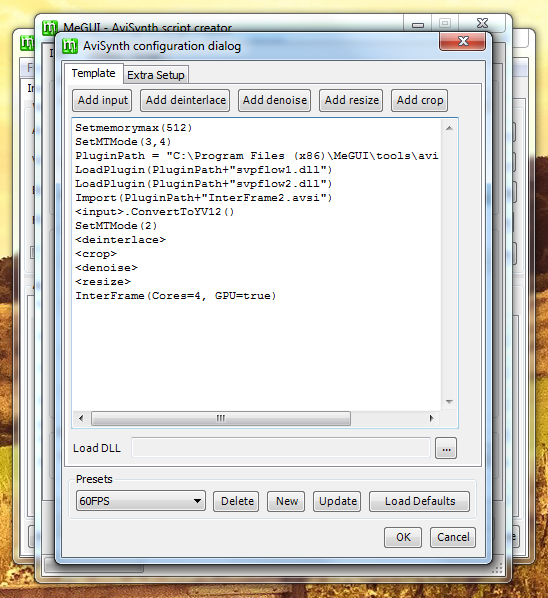 Push ctrl+r, or go to Tools -> AVS Script Creator. 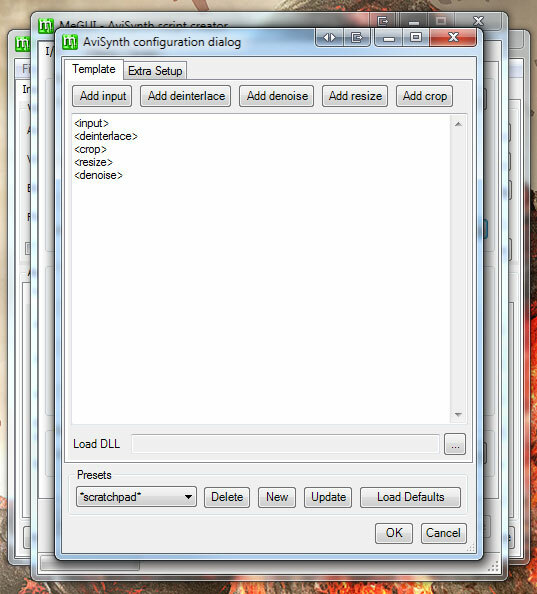 Click the Config button next to Avisynth profile. Now for the script that will do the actual 60FPS conversion. Just copy and paste the following code into the text input area. PluginPath = "C:\Program Files (x86)\MeGUI\tools\avisynth_plugin\"
Important note #1: Make sure the path on the third line is correct. 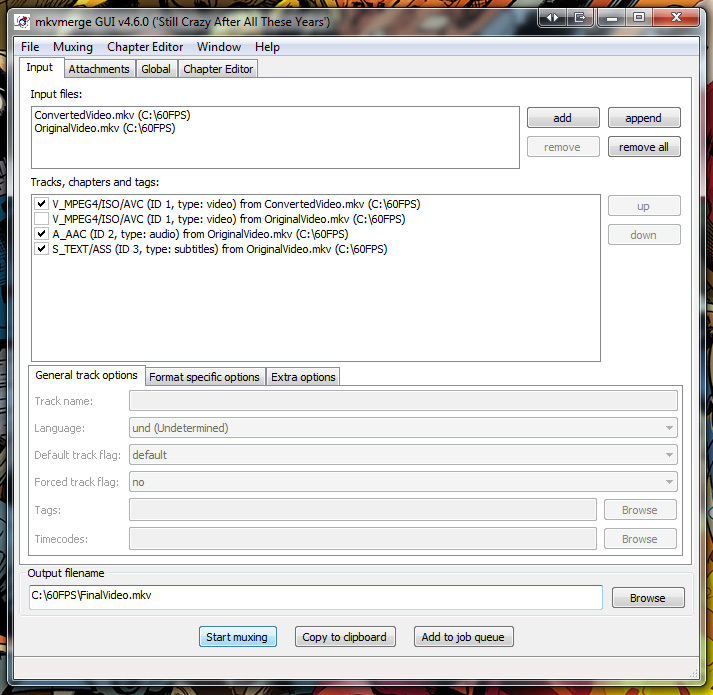 For example, if you are running 32-bit Windows, you will need to modify the path to “Program Files” instead. Important note #2: You should change the number “4” in the script (on line 1) to your number of CPU cores. If you don’t know how many cores your CPU has just Google your CPU and you should be able to find the specs somewhere, or 4 should be fine anyway. Important note #3: If you have a video card, you can improve quality by adding “GPU=true” to the script. However, it may make encoding time slower, so take that into account. If you do this, you may also need to go into your MeGUI tools folder (usually C:\Program Files (x86)\MeGUI\tools\x264) and rename the file opencl.dll to opencl.dll.bak. This will let MeGUI use the version of opencl.dll that your video card drivers have installed, instead of the generic one from MeGUI. Important note #4: This script always outputs either 50FPS or 59.94FPS (60FPS) for compatibility reasons. If you want to always double the framerate instead, so that for example 23.976FPS turns into 47.952FPS (48FPS), you can use the “FrameDouble” parameter. Click the Extra Setup tab and make sure “Prefer DSS2 over DirectShowSource” is checked. Optional tip #1: You might also want to choose your preferred resizer. For aspect-ratio changes (like from 720×576 to 720×480) a neutral filter like Spline36 will be nice. 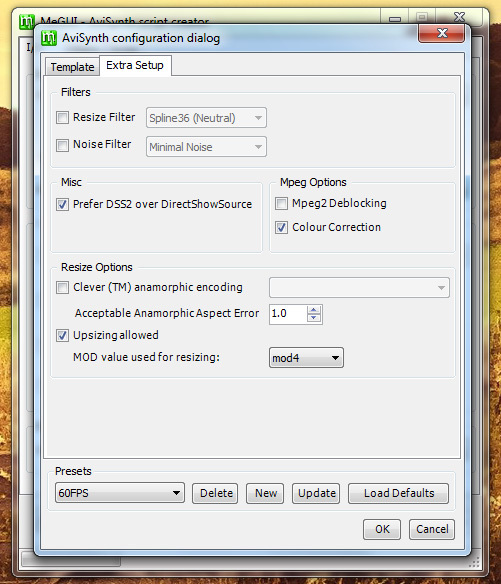 For actual resizing (like from 1920×1080 to 1280×720) a sharp filter like Spline64 will be best. I usually just leave it on Spline36. Make sure to untick the checkbox on the option after you change the default resizer, otherwise it will always be used by default which is often unnecessary. Optional tip #2: I recommend changing the “MOD value used for resizing” to mod4. This gives the best balance between compatibility (a lot of devices like PS3 don’t have good mod2 support) and aspect ratio accuracy (the higher the MOD value, the more likely the aspect ratio is to be skewed more heavily). Now we’re back to the AviSynth script creator window and now that we have our 60FPS AviSynth template made and selected, it’s time to choose which video we want. Just click the … button next to Video Input up the top of the window and find your video, then click Open. A window will pop up with buttons, click the option on the right, usually either “DirectShowSource” or “AviSource”. A window will pop up to show you the video, you can just close that. Click the Save button. The video preview window might pop up again, you can close it again. Now is the time when you need to choose the quality of the video and audio. So when you have your quality, click Queue in the Video encoding section. Now your video is ready for conversion. Now just go to the Queue tab and click Start down the bottom, then wait for it to finish. 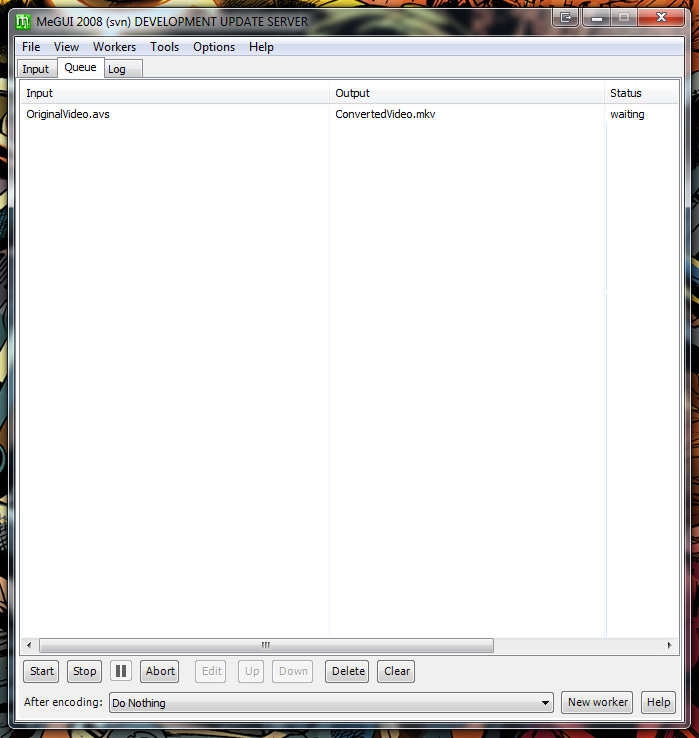 The final step is to add your audio and/or subtitles from the original file to the converted file. This process uses muxing, not conversion, so there is no quality loss. For this we will use the program we installed earlier, MKVMerge. So run that and drag the converted file into that program, then do the same with the original file. If you can’t drag them on, you can use the add button instead. Finally, set the Output filename down the bottom of the window and click Start muxing. When that is done, you have your final video! This might seem like a long process, but actually it is only long once. Since we have now made templates, the process for the videos from now on will be much faster; instead of entering the script each time, now you can just make sure your 60FPS AviSynth script is selected. This file can now be played just like any other video. I personally watch videos on my TV which is linked up to my computer using the awesome, free program called Universal Media Server, and that handles these 60FPS videos perfectly with no configuration. Any comments are appreciated. If you can think of an improvement to the script, or to the process, or if you just found it useful and want to say thanks, please do leave a comment. I would love to know that it’s being used. How can I fix random crashing of vfw4x264.exe? This probably means you are encoding a file using an input mode other than DSS2, which can happen if the clip is .m2ts or .dga (blu-ray) or another uncommon format. I get an error like “can’t load avss.dll”. This means your computer is missing Haali Media Splitter. You can download it here or as part of a K-Lite Mega Codec Pack and the error should go away after you install it. If you install K-Lite, make sure to select “Profile 9: Lots of Stuff” during installation. The file stops encoding after 99%. Can I customize the output framerate to make it 48FPS, 75FPS, 120FPS, or anything else? NewNum stands for “New Numerator” and NewDen stands for “New Denominator”. In general, with NTSC material the NewDen should be 1001 and the NewNum should be 1000x your desired framerate (so for 48FPS you want 48000 and 1001) while for PAL content you might just want something like NewNum=75,NewDen=1 to output 75FPS content. The output seems choppy, can I make it smoother? Why isn’t the GPU being used much in GPU mode? Only some things are done with the GPU in GPU mode, it’s still mostly done by CPU but helped by GPU. Why is the video still the original framerate after running it through MKVMerge? You probably selected the wrong tracks in MKVMerge so you’re getting the original video track instead of the new one; make sure you untick the original video stream before muxing. Try re-installing or updating your video card drivers, and if that doesn’t work then maybe your video card doesn’t support OpenCL so remove GPU=true from your script. Why am I getting the error “SVSmoothFps: unable to load library given in ‘compose'” when I try to run the encoding process, but not when I preview? Go into your MeGUI tools folder (usually C:\Program Files (x86)\MeGUI\tools\x264) and rename the file opencl.dll to opencl.dll.bak. This will let MeGUI use the version of opencl.dll that your video card drivers have installed, instead of the generic one from MeGUI. Why am I getting the error “Error message for your reference: Can not read the video stream”? MeGUI can’t read from folders or files with certain characters, so try moving the video to a different folder and/or renaming the file. Widezu69 for providing the original AviSynth script that I used as a base. Fizick for MVTools, the library that does all the work, and SVP for the modifications to MVTools that make it even better for our purposes. Everyone on various forums for their feedback, this is really a community effort. Updated InterFrame to 2.5.1 which is better quality, more stable and supports more video cards. Updated InterFrame to 2.3.0 which is faster, better quality, supports more video cards and has lower memory usage. Updated InterFrame to 2.1.0 which is much faster, better quality, etc. Updated the scripts to disable GPU-acceleration by default since it causes errors for people with older or no video cards. Updated AviSynth from 2.5.8 to 2.6 after tests which found it is more stable for multithreading. Improved instructions, fixed typos, restructured steps. Updated the Quality script sample. Updated MVTools from 2.5.10.1b to 2.5.11b. Increased the interpolation strength of the scripts. It can cause errors, (stripes and cross-like patterns may cause glitches), but it is better than before for general use. Added a common question to the FAQ; “Prefer DSS2 over DirectShowSource” is disabled. It’s almost unbelievable they are the same frames, but they are. 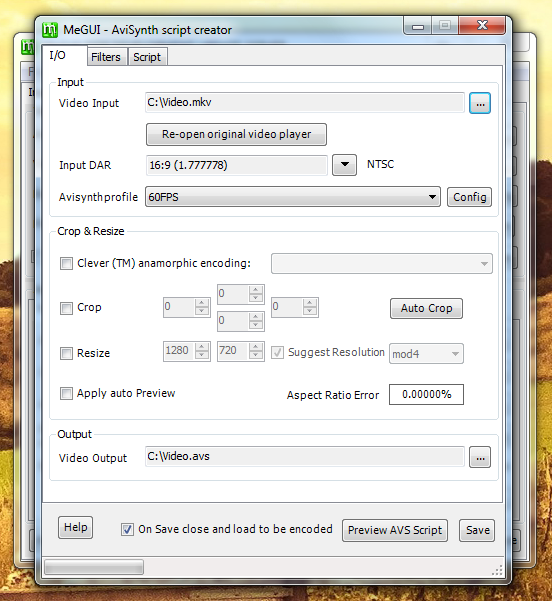 Input uses SetMTMode 2 now instead of 1, since 1 can cause quality problems for .avi files. Reverted to always using 60FPS. Using divisible framerates did provide increased accuracy with technically the same level of smooth motion, but monitors and televisions can’t display those exact framerates anyway which results in less visible smoothness. Thanks to Widezu for pointing this out. Increased accuracy of both scripts by allowing for different framerates depending on the input. See here for more details. The videos still play perfectly on 60Hz and 75Hz monitors/TVs, so don’t worry about that. Updated instructions and wording throughout the whole article, to keep it current with these latest changes and make it easier to follow. There are now 2 scripts; one for quality and one for speed. Both are good.